Our Urban adventure Rafting starts from £45 pp per Adult. £40 per Adult for groups of 12 or more. Min booking of 4 persons – however, we take individuals and groups booking to fill our 6 man rafts. Contact us now to see what availability we have. 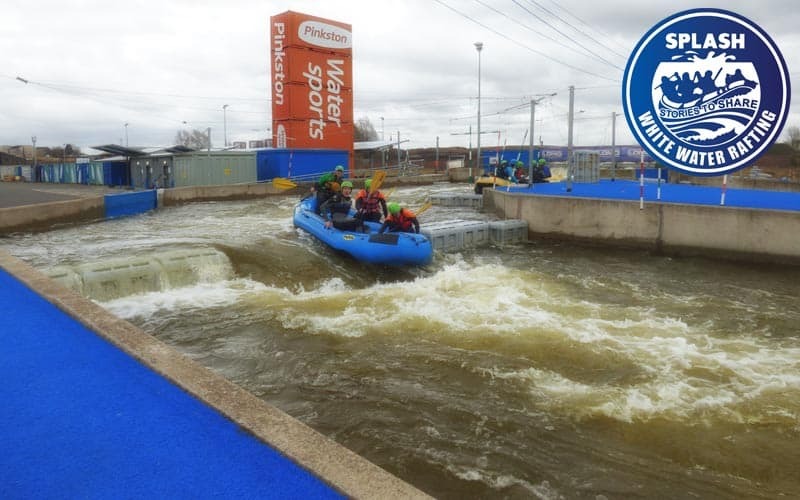 White Water Rafting Glasgow is held at Pinkston Watersports, Scotland’s only artificial whitewater course. 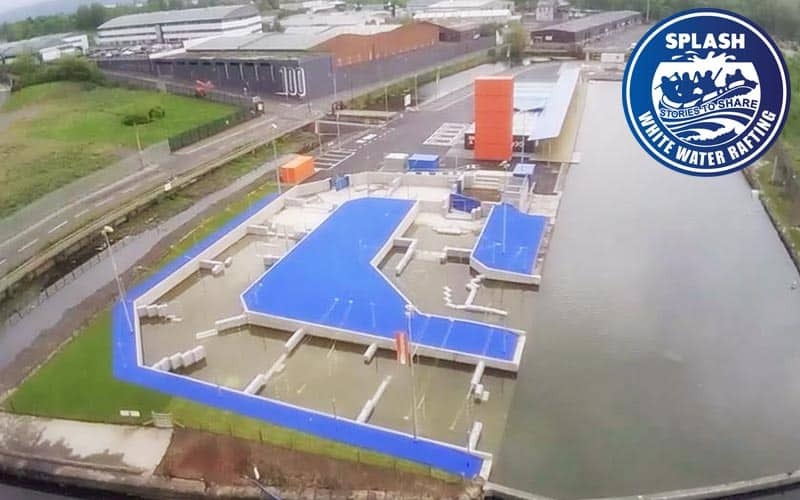 This unique man-made facility is based in the heart of Glasgow and offers to Splash customers the best urban adventure watersports in the country. Yes, that is white water rafting in Glasgow!! 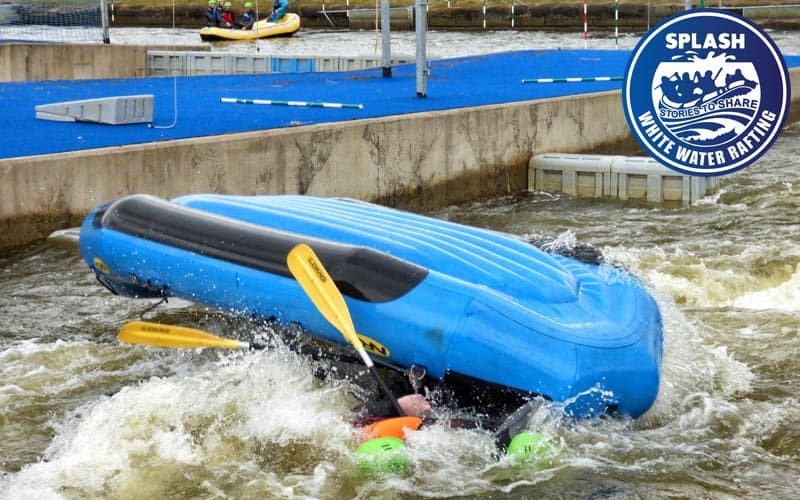 Pinkston watersports is a charity based in Glasgow and is an official Glasgow 2014 Legacy project, that has seen over 3 million pounds invested in its state of the art facility. Facilities include Changing Rooms, showers and toilets on site. White Water Rafting in the heart of Glasgow. Rafting is one of the most exciting river activities in Scotland and now you can experience the thrill and excitement in the heart of Glasgow. Whitewater rafts are engineered to handle everything the course can throw at them. You and your team will work with one of our experienced guides to navigate the raging rapids. The course is 100m long, running up to 7 cumecs (tonnes per second) ie lots of water. The course brings the rapids fast and tight together guaranteeing an exciting adrenaline packed time, every time. The session last around 1 hr 30 min with 1hr on the water. Go around the course as much as you can in the hour. Our dates and times are flexible and scale to demand, contact us now to book your Urban adventure. 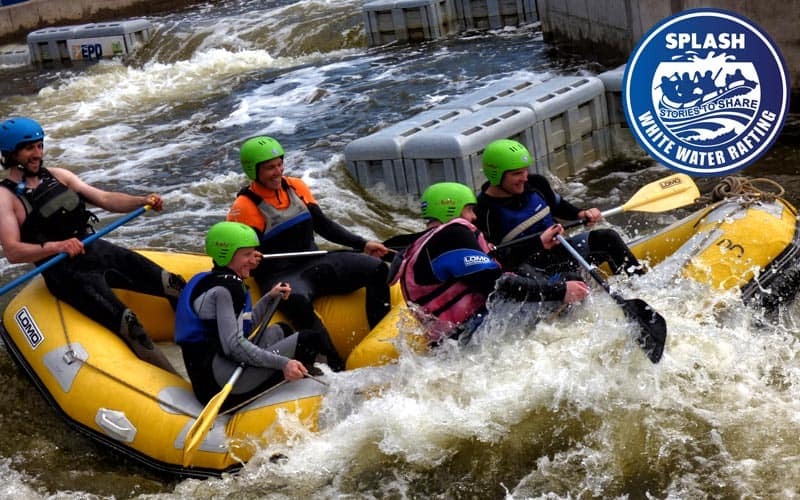 Combine your River Tay rafting with another Splash activity and save money! Why not try out canyoning, river bugs or river duckies? A full day of adventure on the river and in the canyons cost from just £85 per person – guaranteed excitement and exhilaration suitable for the whole family! Between June and September Splash offer white water rafting on the River Tummel, so you can enjoy the thrill of rafting both the River Tay and River Tummel on the same day! Get in touch with Splash by calling 01887 829706 now and we’ll get you booked in. Of course, if you prefer to experience adventure on land all we can offer fantastic many trips including mountain biking, paintball, quad biking or even bungee jumping! We have lots of accommodation partners in Aberfeldy and the surrounding Perthshire area. We can provide 4 star Hotels all the way through to camping to accommodate everyone’s budget and choice. Splash has been organising Stag and Hen Parties for over 15 years. We team up with the best Local and National providers to get you the party that you are looking for . Please head over to our dedicated page to get all the information about what we can offer you with regards to accommodation, Transport and Activities. Different activity but of the course and facility. This was a great, fun experience. The staff were welcoming and friendly and made sure everyone in the group was happy. Great facilities for a city location. Would love to visit Aberfeldy sometime though with the same company… Highly recommended. On every Glasgow rafting adventure, we include all the equipment required plus a professional experienced guide per raft. There is an overall trip leader in charge of every trip. There is also a logistics manager on land who is also a very experienced guide. All equipment required which includes over £150 worth of wetsuits, helmets, lifejackets and paddles. You will be provided with everything you need to raft safely on the River Tay. However we do ask you to bring an old pair of shoes to wear, these will get wet. Bring your swimwear and a thermal for underneath your wetsuit.